Updated my software from VAT to GST. Thanks a lot. Now I am doing all my bills easily. I referred GOFRUGAL to my friend in Vellore and he has started using as well. Our billing was completely down during GST. Thanks to GOFRUGAL Support Team for resolving it on priority and making GST roll out a success for us. Kudos to GOFRUGAL Technologies!! We had a good changeover during the GST transition. The help videos & webinars posted online were a great source of learning for our team. Continue the good work and lets grow together. I am very satisfied with your software and support during the GST roll out. Easy implementation thanks to the videos and webinars which were very useful during this migration. The support team members are ready to solve our problems, accept our suggestions and are always in touch. 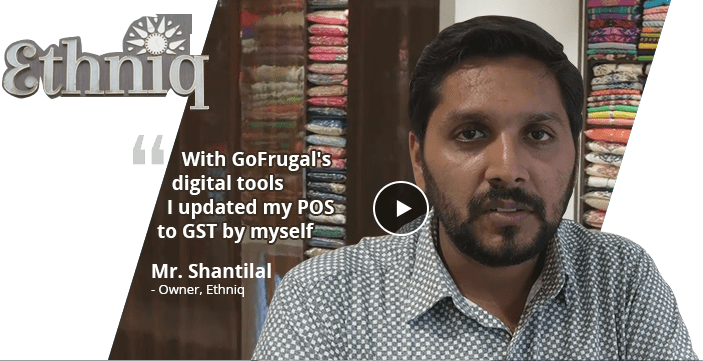 Even during GST transition, we had no worries since GOFRUGAL's videos and webinars helped us for a smooth VAT to GST migration. - Pariwar Trading Company Pvt. Ltd.
We are happy to inform you that the GST Roll out has been done at all our outlets (CK's Foods) and Eeshu's Sweets on the 1st of July. I would like thank the GOFRUGAL Team for providing excellent support during this transition. - Executive Information Systems - CK's Bakery.